Ocean Resort Casino currently is mired in a lawsuit which revealed the resort is having cashflow problems. Bruce Deifik is selling Ocean Resort Casino in Atlantic City after only 6 months of operation. Mr. Deifik, a Colorado hotel developer who made deals with Hyatt to run the Ocean Resort Hotel, did not reveal the name of the new owner. 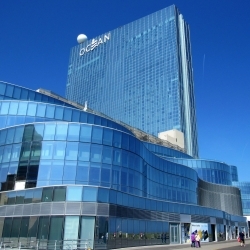 Ocean Resort Casino is the new name of Revel Casino, which Bruce Deifik bought from Glenn Straub in early 2018. After several months of preparation, the casino opened for business again on June 28, 2018. The new ownership group plans to make a $70 million investment in the property, besides the cost of buying the Revel Building. Deifik and his family will maintain a minority ownership in Ocean Resort Casino. The transaction will be finalized next Thursday. Though the name of the majority owner is not known at this time, it will be before long. To operate the casino, the owner must gain licensing from the Division of Gaming Enforcement. That license is public knowledge, so Ocean Resort Casino’s new owner should become known soon. Too Many Casinos in Atlantic City? The Division of Gaming Enforcement said it has been monitoring the casino’s finances and would review the property’s sale. The quick sale of old Revel Casino stokes speculation that Atlantic City has too many operating casinos. At the beginning of 2014, Atlantic City had 12 active casinos. That year, four operations closed: The Atlantic Club, The Showboat Casino, Trump Plaza, and Revel Casino. A fifth property, Trump Taj Mahal, was saved from closing by top shareholder Carl Icahn’s $20 million investment. By October 2016, Trump Taj Mahal was closed by Icahn in the midst of labor strife. With seven remaining operations, Atlantic City casinos each reported growth. Analysts suggested that seven Atlantic City casinos seemed to be the right amount for the new level of tourism to the city. It did not stay that way for long. In early 2017, Carl Icahn sold Trump Taj Mahal to Hard Rock International, which is owned by the Seminole Tribe of Florida. Hard Rock International spent over a year and $500 million to renovate the Taj, then reopened the casino on June 28, 2018 as the Hard Rock Atlantic City. Ocean Resort Casino opened on the same day, bringing the total number of casinos to nine. Many wondered if Atlantic City could sustain two full casinos. Of the two, Ocean Resort Casino was the one questioned the most. Revel Casino was a massive $2.4 billion dollar project, but it was planned before the real estate crash and the Global Recession. Though it is a beautiful skyscraper, by the time it opened in April 2012, Revel Casino was carrying a huge debt burden and operating costs. Critics said Revel was at the wrong end of the Boardwalk, too far away from the action. And while the building was opulent, it seemed ill-designed for casino gaming, due to the huge escalator visitors used when entering the building. Ultimately, the attempt to build a Las Vegas-style casino resort in working-class New Jersey did not work out well — the casino filed bankruptcy twice in 29 months. When Bruce Deifik took over, he planned to scale back the opulence and make the casino available for all price ranges. He also reorganized the entrance and made strategic deals to give visitors a better vacation and leisure experience. The improvements were only partially successful. Customers still complained about the location and said the hotel rooms being used were too small — or at best said they were “nothing special”. Through several incarnations, Revel Casino/Ocean Resort Casino has yet to find its proper place in the Atlantic City market. Stories have circled since early December 2018 that Bruce Deifik was having trouble making payments on Ocean Resort Casino. Philly.com reported that contractors claimed Deifik still owed them $1 million for work they had done on renovations. The rest came by way of court documents, because of a lawsuit by a former partner of Ocean Resorts: Joey Morrissey. The New York City nightclub guru was a partner on the HQ2 nightclub which opened alongside Ocean Resort casino. Mr. Morrissey sued Ocean Resort Casino in early December, claiming he was owned compensation for work he had done on HQ2. Morrissey claimed in the lawsuit his relationship with Bruce Deifik had soured when he took up the owner’s behavior towards female employees, who had complained to Joey Morrrissey. That lawsuit is ongoing, though it is unknown whether it has any bearing on the sale of Ocean Resort Casino.